The author, a veteran hike leader for the Appalachian Mountain Club and Westchester Trails Association, lives in Tarrytown. Two section maps for both the Westchester and New York City Aqueduct route are for sale on the right column of this page. To the dismay of anyone who likes long uninterrupted walk-time, many parts of the Old Croton Aqueduct (OCA) trail are really not ideal. Diehard walkers like me object to trail sharing with bikers, phone addicts and occasionally off-leash dogs. We’re not an unfriendly bunch; but they all tend to disrupt one’s pace. Even obvious detours can be unsettling; over time, manmade intrusions have altered the original right of way and forced the creation of patchy alternate routes. Happily, a tranquil and contiguous section of the Aqueduct trail can be found at the northern reaches of the park. F.B. Tower, a Croton engineer in the 1840's called it “the wild region of the Croton". It remains the most rustic section of the entire Aqueduct trail, with much of it looking like it did in 1842. In many spots the trail is carved into steep hillsides. This particular 1-way stretch of almost 3 miles includes the Croton Gorge Unique Area, good bird watching, views of both the Croton and Hudson Rivers and a glorious view atop the New Croton Dam. The hamlet of Crotonville, town of Ossining is the start point for this essentially flat, historic hike. It features easy parking and 3-hours-plus of steady, moderately fast pace walking roundtrip. Hikers can picnic and sunbathe at the dam, which is the halfway point of this back-and-forth walk. At the far end of the dam’s spillway bridge, large concrete barriers make a handy picture-taking and snack spot. Or walk down to grassy Croton Dam Plaza, at the bottom of the spillway, to portable toilets (not always open) and picnic tables. One of the whimsical pleasures to this “rustic” walk is the sudden appearance of the dam itself, a gorgeous manmade light and sound spectacle. After reaching the terminus point of the OCA Trail, turn right onto a wide dirt road. One literally walks out the woods and onto the bridge over the New Croton Dam spillway, once known as “the second-largest hand-hewn stone structure after the Pyramids”. Finished in 1906, it is still breathtaking to see. At the time of its completion, this was the tallest dam in the world. Don’t miss the unusually organic-looking rock waterfall that blossoms from the north side of the spillway. 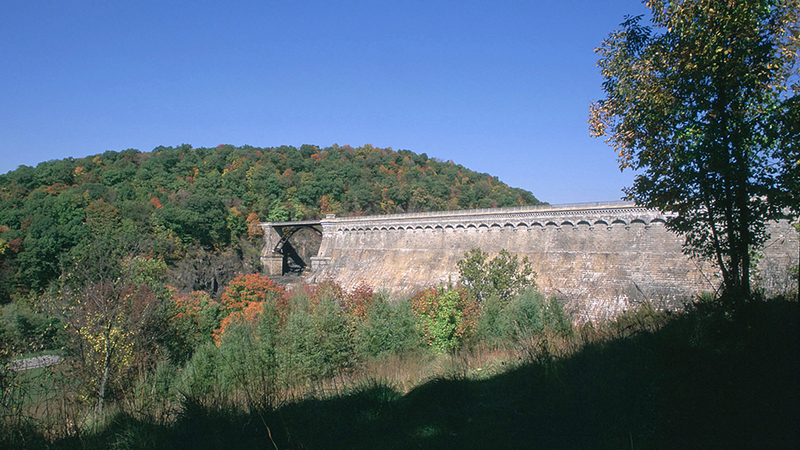 Irish workers built the first Croton Dam. But it was largely southern Italian stonemasons who, fresh off the boat, arrived in Croton as contract labor for the new dam. In fact only the top half of the dam is visible. The rest is buried in the massive excavation, down to the bedrock, over 200 feet below the top of the dam, then filled in after construction to create the level plaza at the foot of the dam. Long before the dam looms there are several spots worth mentioning. First, walkers will notice the quiet -- even the Croton River rapids are often audible (off to the left/west and down the ravine). This walk starts at Gerlach Park in Crotonville and heads north. But in the winter mason-work lovers may take a quick look at the Indian Brook culvert, just 2 minutes in the other, southerly, direction. It was massive hand-hewn stonework like this that made possible the gentle, 13-inch-per-mile grade of the Aqueduct all the way into Manhattan. To see the Indian Brook culvert, head right off the trail at Reservoir Road (just before the GE campus gate). In back of the houses you can clearly see the buttressing stonework that still guides the running brook. This section of the Croton River is also known to movie buffs. Along the riverbank is a well-known tribute spot to silent movie making. Somewhat south of the “Croton Gorge Unique Area” OCA Trail sign is Tarzan’s cliff, known to locals as Mayo Landing. Actually across the river from the OCA Trail, the cliff was the setting for an early Tarzan movie scene. It was on the grounds of the scenic Nikko Inn, a popular watering hole built in 1907 by Clifford Harmon to attract theater and film stars from New York City. Hotel guests rode gondolas on the river to admire the steep cliff face. A Croton centenarian, the late Edward Rondthaler, liked to relate that Tarzan the actor famously balked at jumping off the cliff. For 50 cents, a local boy coolly took his place and dove off. About four-fifths of the way to the dam, the trail crosses a band of high-tension wires. Birders will appreciate the large span of underbrush that grows here. Even in winter the general area is thick with migratory birds. Since the widest spot in the Hudson is nearby and unfrozen, many Canadian geese stay for the winter. Big birds also roost in the pinewoods just south of the dam. On most winter days eagles skim and hunt for fish on the partially frozen reservoir. (One of us counted 7 eagles out on the water on a recent January day.) One scenic Hudson River vista opens up along this walk. It is a long view of the Hudson, and easier to find on the return trip, off to the right between the 2nd and 3rd ventilators (counting from the dam). The vista is only visible in fall or winter. The north end of the OCA Trailway connects to other walks. The dam spillway is actually part of the 12-mile Briarcliff Peekskill Trailway. However the Briarcliff Peekskill trail is not as well kept or as clearly laid out as the OCA and the views, at least walking north from the dam, are disappointing. Heading south on the BP trail, hikers can reach Teatown Lake Reservation in 1.75 miles. Another diversion is the Croton Gorge Trail, a pleasant wooded walk into the streets of Croton via a one-lane bridge. To get to Quaker Bridge, turn off the OCA Trail where it crosses Quaker Bridge Road (trail crosses the road twice; take either route and head down, towards the river). The spur up to the trail is just after the old bridge, on the left. Today this section of the Croton River is picturesque but its history is fraught. When part of the original Croton Dam collapsed in 1841, a 50-foot wall of water rolled through the narrow and populated gorge. The present bridge is the 4th to be built there, in 1894. For a full day’s ramble walk further into town to Bethel Cemetery - the surprise resting place of 2 famous African-Americans. Lorraine Hansberry the playwright of Raisin In The Sun, was buried here in 1969. The other is John Peterson or “Rifle Jack”, who set in motion the events that led to the capture of Major John Andre as a British spy in 1780. With help from Lesley Walter and Tom Tarnowsky, both FOCA Board members, and the Croton Historical Society. See also www.crotonfriendsofhistory.org Note: All the places mentioned can be found on the Old Croton Aqueduct Map & Guide. The start point, Gerlach Park, is unnamed but the parking lot steps up to the OCA Trail are clearly visible on the map, just next to the words “Indian Bk” on Quaker Bridge Road in the town of Newcastle. OCA Trail: This section of the Old Croton Aqueduct Trail passes 3 ventilators and ends at the New Croton Dam. It’s a brisk 3-hour-plus roundtrip walk starting from Gerlach Park and walking north. The turnaround is at the dam. South of Gerlach there is a trailside OCA map sign that details the southward route. It’s near the Fowler Ave gate of the GE campus. But the trail is not contiguous near GE and the detour crosses busy Rte. 9. Additional Routes: From the dam you can continue walking north or south on the Briarcliff-Peekskill Trailway. Or walk across the Croton River to the 1/2-mile wooded Croton Gorge Trail. It leads into the village of Croton-on-Hudson. See Old Croton Aqueduct Map for details. Where to park: at Gerlach Park, Town of Ossining, free parking to all. Find the wide railroad tie steps leading up a steep slope from the back of the parking lot. The Old Croton Aqueduct Trail is at the top of the slope; turn left to head north to the dam. How To Get There: You can reach Gerlach Park via Route 9. Exit onto Old Albany Post Road/Quaker Bridge Road, which is just south of the intersection of Routes 9 and 9A. The road winds. The park is on the right. Another start point is at the top Fowler Ave., on the grassy verge by the side of the GE campus gates. See Old Croton Aqueduct Map. If you start at the north end, the dam is inside Croton Gorge Park. The park is off Route 129 (Lower Yorktown Road) in Croton-on-Hudson.